Little is being done to reduce slow play even though there is a general agreement that a round of golf takes too long. Imagine how long a round would take today, if the number of holes had not been reduced from 22 to 18 in 1764. The jury remains out on whether motorised golf speeds up or slows down play. One disadvantage of the obligatory cart is that it adds to the cost of the outing. Whenever possible we should respect the history and tradition of the sport for golf is a walking game. This means setting out on foot, as exercise is one of the golf's benefits. The early Scots played at a rapid pace. They were known to play 54 holes in a day. The pace of their play may have been dictated in some way by the inclement weather. When it is cold and damp with an icy wind blowing off the sea who would want to dawdle along at a snail’s pace? Golf is becoming increasingly popular in countries that previously shunned the sport because it was seen as elitist. China and India are now the new frontiers of the sport. However, popularity brings its own problems. The more people who want to play golf, the greater the congestion at the public courses where they can play. When a course is overloaded, the pace of play becomes a stop-and-go affair. 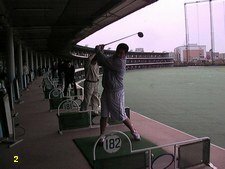 Many Japanese never progress beyond a multi-storey driving range because of the lack of space on a golf course. The advent of televised golf was in 1947 when the US Open was televised locally in St Louis, Missouri. Six years later golf was being televised nationally. Beaming golf in to the living room coincided with the arrival on the golf scene of Arnold Palmer, and a few years later Jack Nicklaus. This was the watershed for golf and the start of slow play. As big money started to pour into the game, more and more people in a new wave of excitement began to experience an addiction like no other. Golf was now the game where you made friends, sealed business deals, and could play badly without anyone caring. Demand began to outstrip supply and the pace of play slowly ground to a halt. When you watch golf on television you can appreciate how the game has slowed down. We know that the professionals play for a lot of money, and sometimes it is hard to pull the trigger. However, the longer you stand over a shot, the more time there is for doubt to creep in. Constant uncertainty eventually leads to bad scores. Playing as a three-ball, professionals can take more than five hours to complete their round. This is in spite of having caddies to carry their clubs and to rake the bunkers. Everything is in their favour to speed up play. There is even a penal system in place to deal with slow play and slow players are put on the clock for being out of position. Unfortunately the Tour seems reluctant to make regular use of it. A bad time means your group is more than 10 minutes behind the group in front. You are allowed 40 seconds to complete your shot once it is your turn to play. In many cases this appears not to be enough time. In no other place on the golf course is slow play more in evidence than on the putting green. Some pre-putt routines resemble land surveying on a grand scale. Some players even have the annoying habit of appearing to be ready to putt, before backing off and rechecking their alignment. So what is to be done to speed up the game? In the first place slow play has the effect of removing some players from the game. They simply can’t afford the time, or get bored with waiting on their shots. Others have never learned the etiquette of the game. Their view is that a green fee entitles you to take as long as you like. You can raise the cost of play, but pricing people off the course denies many the opportunity of enjoying one of life’s great sports. Building more courses is expensive, and increasingly there is a conflict with the authorities over environmental issues. Maybe to counter slow play we should introduce a driving licence system. Golfers will have to pass an etiquette examination before they are allowed on the course, and then be required to observe minimum speed levels while playing.